At Discovery Harbour, customer service is accessible customer service. We provide all of our goods and services in a way that respects the dignity and independence of all of our visitors. This means that we are committed to giving people with disabilities equal opportunity to access all of our events, programming, and goods and services. Staff are trained on how to interact and communicate with people with various types of disabilities. A support person accompanying a person with a disability is admitted free. Service animals are welcome on the historic site, in modern buildings, and in retail, restaurant and theatre outlets. Assistive devices (wheelchair) for visitor use. 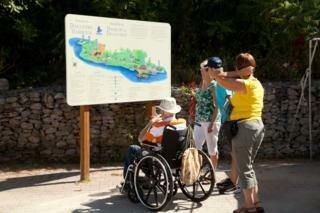 Staff assistance for people who use assistive devices to get the best possible experience from their visit. Orientation videos available with subtitles in English and French. Please NOTE. The historic site is approximately 1.5 km in length. It does require walking and the geography is hilly. We’re always striving to improve our service. We value your feedback on the way we provide group and event programming and goods and services to people with disabilities. Visitor Comment Cards are available at Visitor Services.